One of our team members, Emily Trott, came back from the Southeast States CPE Conference and told me I had to meet Joey Havens, executive partner of Horne, LLP (a Top 50 CPA firm). She said he was a living example of many of the concepts we have been talking about at MACPA / BLI, and she was inspired by his message of what CPA firms are all about and the challenges they are facing. Joey believes, as we do, that “what got you here won’t get you there” and that firms are facing major changes and disruption like never before. In keeping with our philosophy that all challenges are frustrated opportunities, I took the liberty of flipping Joey’s challenges. Build a leadership pipeline to overcome The Leadership Void. Make your firm a talent magnet to overcome Recruiting and Retention Rationalizations. Walk the talk to overcome Seeing is Believing. Move to a new firm business model (yes, that means value pricing) to overcome Time Stinks. Purpose and passion are the heart of the matter to address Heart Matters. If there is one whitepaper you should read for 2015, this is it. Joey gets it and is one of those leaders who is walking the talk. 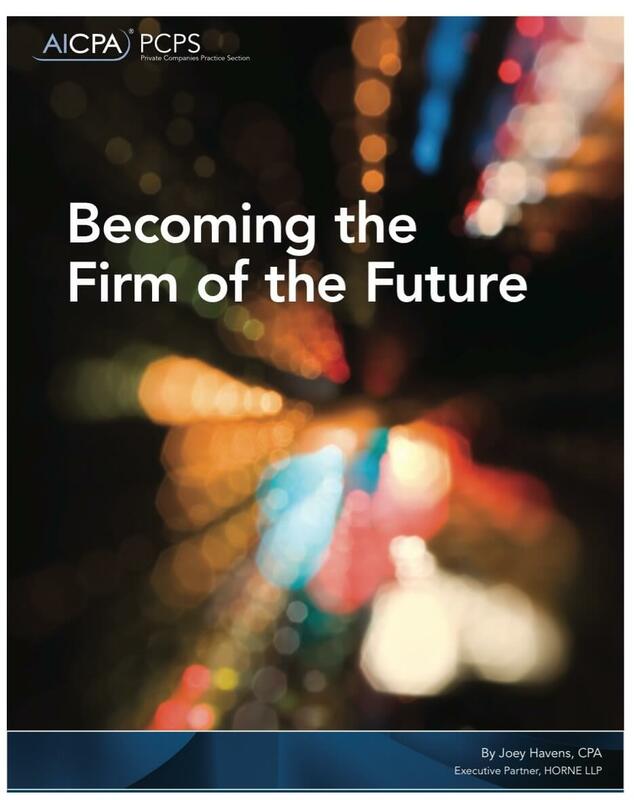 You might also enjoy this presentation from Ed Kless (one of Ron Baker’s Verasage Institute fellows) on the firm of the future.